Hardcover, 12.5 x 17.75 in. / 60 pgs / 24 color. Whether it was waged at Pitcairn Island, Nagasaki, or the Falkland Islands, whether during the Han Dynasty, the English Empire, or the Cold War, battles have been fought, people slaughtered, women raped, children orphaned, and so on, as the pages of history turn. The current world situation, in the very first years of the twenty-first century, is certainly no exception. The visual residue of these battles changes over time, growing more and more dense, more and more immediate. But always there have been maps, detailed cartographic evidence of what was known, what was planned, what was going to happen. 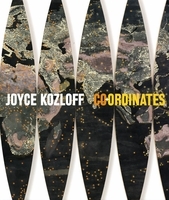 For over a dozen years, Joyce Kozloff has centered her art on the theme of cartography, blending into her simulacra of old maps mutations that often raise geopolitical issues. She discovered in these images of physical terrain a mental territory as well--one that charts the topography of power. Boys' Art is a series of meticulous, densely collaged maps that Kozloff has fashioned from hundreds of years of source material, the most recent of which are her son Nik's childhood drawings of war. On top of her pristine pencil copies of historic military maps--culled from the Han dynasty to the Roosevelt administration--Kozloff has layered the movements of war, as found in Tin Tin and Babar, in a seventeenth-century woodblock by Hokusai, in a George Grosz pen and ink drawing, or a Leonardo da Vinci sketch. Surreal narratives emerge, pitting cartoon elephants against samurai warriors, scribbled monsters against Indians on horseback, and Renaissance soldiers against Frenchmen in khaki fatigues and pith helmets. Presented in an oversize format at a 1:1 scale with the original collages, Boys' Art lushly presents a series of work that unfortunately could not be more timely. But then, as Kozloff herself writes in the introduction, there has always been war. A special version of Boys' Art includes a hand-tinted etching by Joyce Kozloff, produced in a limited edition of 50 at the Vermont Studio Center Press. Edited by Phillip Earenfight. Text by Nancy Princenthal, Phillip Earenfight. FORMAT: Hardcover, 12.5 x 17.75 in. / 60 pgs / 24 color. Published by D.A.P./Distributed Art Publishers.